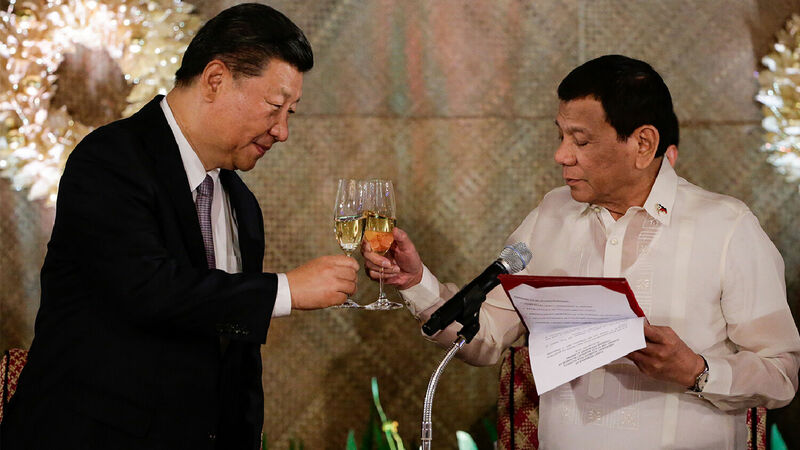 Chinese President Xi Jinping (left) and Philippine President Rodrigo Duterte raise a toast during a state banquet at the Malacanang Presidential Palace in Manila on Nov. 20, 2018. The Philippines sees that America’s power is declining and China’s power is rising. The Philippines has been arguably the most pro-American nation on Earth. Its history with the world’s lone superpower, the United States, has stretched for more than a century, with the two suffering and overcoming together and building a strong bond. But as strong as that bond is, it will soon break. In the late 1800s, the U.S. liberated the Philippines from Spanish occupation and soon after colonized it. This marked the first time that the U.S. had deliberately set out to conquer an overseas territory and occupy it. Under American rule, the Philippines flourished. Between 1900 and the 1920s, American investment in health and education led to a doubling of the Filipino population. In just under a generation, literacy increased from 20 percent to 50 percent. The American colonizers redistributed land to peasants. They built roads, railways, ports, dams and irrigation systems to make Filipinos’ lives better. Filipinos finally received the freedoms they had long sought under Spain. One of the most remarkable symbols of a strong alliance between the Philippines and the U.S. was the Mutual Defense Treaty (mdt), signed in 1951. One of the oldest security treaties in the Asia-Pacific region, the mdt has dissuaded more powerful Asian nations from attempting to pressure or invade the Philippines. The arrangement has also benefited the U.S. as a cornerstone of America’s ability to maintain peace and stability in the region. Many analysts see such public statements as an indication that if the U.S. doesn’t stand up to China and protect its allies in the region, the Philippines will scrap the Mutual Defense Treaty. A few agreements signed between Washington and Manila under the mdt have already been largely downgraded by Duterte. The 1998 Visiting Forces Agreement allows the Philippines and U.S. militaries to conduct annual joint exercises. Every year, Philippine and American forces participate in the “Balikatan” (shoulder-to-shoulder) exercises. Since Duterte was elected, the military exercise has moved away from contested waters in the South China Sea. Instead of it being a combat-readiness exercise, the Philippines has shifted its focus to less relevant drills such as counterterrorism, humanitarian aid and disaster relief. Another agreement that has been scaled back is the Enhanced Defense Cooperation Agreement. Signed in 2014 for the purpose of defending maritime territories in the South China Sea, the deal gives the U.S. access to several Philippine military bases. But construction of U.S. facilities on Philippine bases has been delayed, and a military outpost close to the hotly contested Spratly Islands could be excluded from the agreement. Any hope of expanding the deal has vanished in light of Duterte’s anti-American stance. The Mutual Defense Treaty, Enhanced Defense Cooperation Agreement and Visiting Forces Agreement are the only defense treaties that the Philippines has with the United States. President Duterte has downgraded their scope and threatened to do away with them. The Duterte administration is scorning such treaties because its trust in America is deteriorating. And this presents a major opportunity for China. Duterte’s statements are only one sign that the Philippines is willing to improve relations with China at the expense of its alliance with the United States. During Chinese President Xi Jinping’s state visit to the Philippines last year, he and Duterte signed a memorandum of understanding. The agreement, which has a time frame from November 2018 to November 2028, lays out immense Chinese investment on trade and infrastructure in the Philippines under China’s Belt and Road Initiative. During Xi’s two-day visit, he and Duterte also signed 29 separate deals, including a plan to convert Clark Air Base, one of the largest American bases in Asia during the Cold War, into an offshore center for Chinese technologies. The Chinese state-run company, the Gezhoba Group, has agreed to pay $2 billion to build a 500-hectare industrial park there. This commercial center could potentially be turned into a military base. China is also eyeing other former U.S. military bases, such as the Hanjin Shipyard in Subic Bay. Clark Air Base and Subic Bay were two of the largest American military bases in the Philippines before U.S. troops were ousted in 1992. China has expressed strong interest in acquiring these bases. From the start of Duterte’s presidency, bilateral trade between the Philippines and China has increased. Since 2017, China has become the Philippines’ largest trade partner. In November 2018, Philippine exports to China amounted to $686 million, and imports from China were $1.8 billion. Meanwhile, the U.S. imported $893 million from the Philippines and exported $622 million to the Philippines, making it just the fourth-largest trading partner. In 2017, China surpassed the U.S. to become the Philippines’ second-largest tourism market. While South Korea still accounts for the largest tourism market in the Philippines with 1.6 million arrivals, China is expected to become the Philippines largest tourism market in just a short time. Many lawmakers point to improved Philippine-Chinese relations as the cause of the sudden surge of Chinese tourists in the Philippines. Chinese investment has also risen in the Philippines since Duterte became president. With a 67 percent year-on-year increase, investments from China reached more than $50 million in 2017. In 2018, China more than tripled its investment with over $165 million. China has ramped up its investments in the Philippines, proving that it seeks an alliance. A seismic shift is coming to Philippine-Chinese relations. China’s desire for greater control over the Philippines is driven largely by geography. China has always feared a U.S. blockade in the First Island Chain, a series of islands in China’s periphery running from Japan to Indonesia. Such a blockade could lock China out of world trade, including many of the energy imports the nation’s economy relies on. One of the ways China can avoid such a blockade is by making an alliance with one of the countries along the First Island Chain, allowing China to use its waters and ports as a secure passage. Ideally, this strategy would also deny the U.S. access to ports and bases there. Such a situation would force the U.S. to confront China in hostile waters. The Philippines is China’s only viable option for this strategy. It is also the only nation along the First Island Chain that would likely align with China instead of the U.S. Such an arrangement would lead to the fulfillment of major Bible prophecies. The Philippines and other Asian nations see that America’s influence is dwindling—and they’re taking action. Recognizing that China’s military and economic clout is replacing the U.S. in the region, they are rallying around China. This was prophesied. When you put India and Japan together with Russia and China, it is easy to see how an army of 200 million soldiers could be formed. With other Asian nations joining in, you quickly reach combined populations of 3.5 to 4 billion people! Under extreme circumstances like those described in these end-time prophecies, it is not hard to imagine 1 in 10 or 20 people going to war. Will the Philippines be part of this kings of the east alliance? I said that when we failed to win in Korea! … I say it again, now that the United States government endorsed this Cuban fiasco—its president gave the “go ahead”—and God, the God America has deserted, gave it its most humiliating defeat! What does the Cuban debacle mean? It means, Mr. and Mrs. United States, that the handwriting is on your wall! Mr. Armstrong’s forecast of diminishing American power is based on Bible prophecy. In Leviticus 26, God outlines the blessings ancient Israel and its descendants would receive if they obeyed God and curses if they disobeyed. Verse 19 states that God will break the pride of Israel’s power. One of the modern-day nations descended from ancient Israel is America. (For proof, request your free copy of Mr. Armstrong’s book The United States and Britain in Prophecy.) A quick look at America’s wartime history after World War ii shows that God has indeed broken the pride of America’s power. The once great superpower that many nations like the Philippines revered has lost the will to defend its allies from nations such as China. This is why the strong bond between the Philippines and the U.S. is certain to break. For this prophesied time [the times of the Gentiles] to occur, there has to be a shift of power to China. This is what we are seeing as Asian nations pull away from America, and tilt suddenly toward China. Bible prophecies show that these trends will lead to a time of unparalleled global conflict and suffering (Matthew 24:21). Knowing about that impending war and suffering makes it sobering to watch the decline of America, and the rise of a bloc bent on destroying the global order. To read more about this subject, please request your free copy of The Prophesied ‘Prince of Russia’ and He Was Right.